Sometimes the best gifts don’t fit under the tree. Just in time for the holidays, a rare 1956 Ferrari 290 MM is heading to the auction block on December 8—and it’s the ultimate gift for a certain kind of serious car collector. Slated to headline an RM Sotheby’s auction at the Petersen Automotive Museum in Los Angeles, Calif., the cherry-red two-seater has an enviable motorsport pedigree: It was raced by Scuderia Ferrari during the 1956 and 1957 seasons and piloted by an impressive roster of factory team drivers, including Juan Manuel Fangio, Phil Hill, Peter Collins, Wolfgang von Trips, and Sir Stirling Moss. 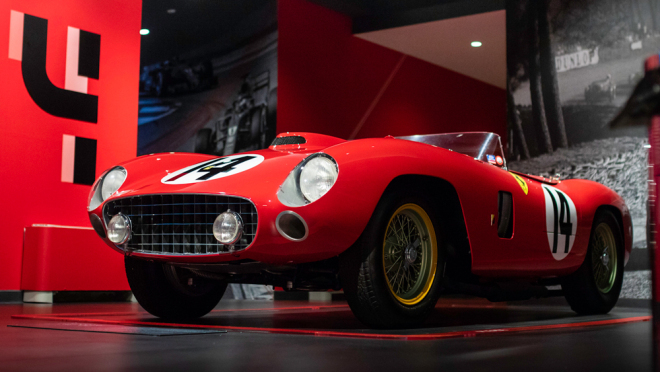 Originally developed by Ferrari to compete in the 1956 World Sportscar Championship and the Mille Miglia, the sporty spectacle was designed to give cars from Maserati and Mercedes-Benz a run for their money. Distinguished as the fourth and final example ever built, chassis No. 0628 finished second in the 1956 Mille Miglia in 860 Monza specifications (piloted by Peter Collins and Louis Klemantaski). The car also crossed the finish line in a number of other races, placing fourth at the Targa Florio (driven by Olivier Gendebien and Hans Herrmann) and second at the Aosta-Gran San Bernardo Hillclimb (piloted by Umberto Maglioli). 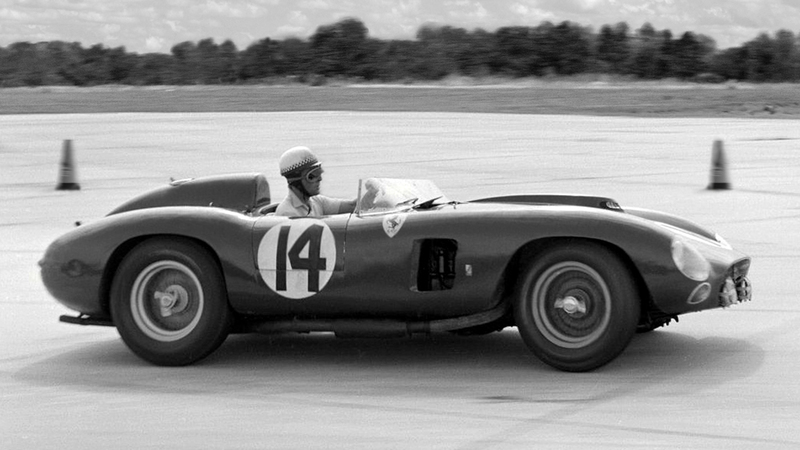 Sir Stirling Moss raced the car to victory at the 1957 Bahamas Speed Weeks in both the Memorial Race and the Nassau Trophy Race, and Phil Hill and Wolfgang von Trips drove the car at the 12 Hours of Sebring. Over the next five decades in America, the car earned multiple podium and first-in-class finishes and spent time in private collections. After being sold to a collector in England, the car was driven in the Tribute to Juan Manuel Fangio Parade during the Goodwood Revival in 2011. Later that year, after being purchased by a new owner, the car underwent a full, concours-quality restoration by Ferrari Classiche in Italy to its 1957 12 Hours of Sebring configuration. The Ferrari will be joined at the auction by 40 diverse collectible cars from significant eras. The car will follow the record-setting sale of a 1962 Ferrari 250 GTO that crossed the auction block this August for $67.7 million, making it the most expensive car ever sold at auction. It is estimated to reach a price of between $30.8 million and $36.4 million this December. Happy holidays, indeed, for one lucky buyer.